This super female trumpeter/vocalist has a jazzy, funky pop sound that blends multiple styles into a smooth jazz groove. 5. Can Our Tears Put Out the Fire? An alumni of North Texas state University, Ginetta has decades of experience both on the road and in the studio. She has played trumpet with numerous Latin, Merengue, Calypso, and Compa bands taking her on tours thru Puerto Rico, S. America, Trinidad, Haiti, Martinique and Guadeloupe. Blues was also a defining factor in her musical evolution and she was an honorary "Holmes Sister" with the incredible Holmes Brothers touring with them through New England and Nova Scotia. She was also a regular with the Albert Collins band whenever he played NYC. On the Rock & Roll front Ginetta played with the Boo Radleys in their U.S. debut Tour covering seven weeks and 40 states! The Vendetta was created so she could sing and play all her originals,and lead a band combining all the musical styles she had absorbed... Since it's inception they have played all over the world...from Beirut to Kosovo....She is a festival favorite and counts The Ocho Rios Festival (four years in a row), The Pristina Jazz Festival (Kosovo Republic), The Gainesville Jazz Festival, The Hudson Black Arts Festival and many others as her most special shows! She has received three billboard Song competition awards and is a yearly reciepient of the AscaPlus award for songwriting! 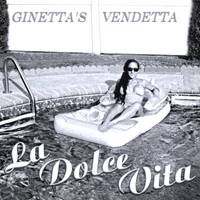 With her horn as her passport and her power trio backing her, there's no place Ginetta's Vendetta cant go!! !